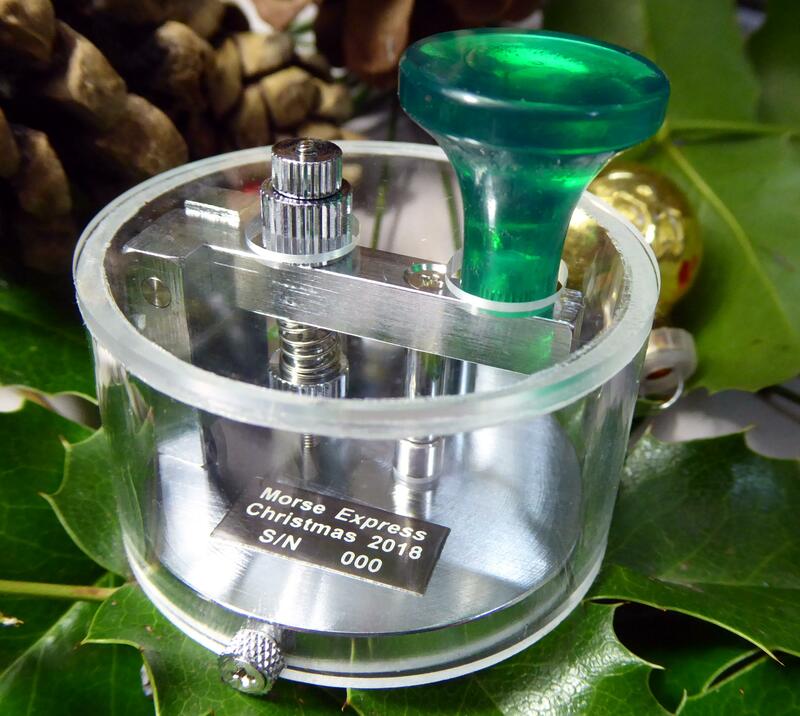 This year Morse Express is doing something a little different with its signature Christmas Key. The 2018 Christmas Key incorporates an integral crystal-clear acrylic cover over a chrome plated brass key on a circular base, and with a machined translucent green knob. Attach your cable to the miniature binding posts, put the cover back on, and you are ready to put this attractive little key to work for Straight Key Night, on a mountaintop, or in the comfort of your home radio shack. The internal wires from the miniature binding posts are traced into the bottom of the base, which is elevated a few millimeters above the table by small rubbery feet, which also keep the key from slipping. Contact spacing and spring tension are both controlled by the single adjusting screw just forward of the trunnion. The cover is secured with 3 knurled thumbscrews is easily removed, and provides an entry way for a cable. The cover height is 30mm ( 1.2") from the table to the top of the cover, and 50mm (2") from the table to the top surface of the knob. The base diameter is 50mm(2") or 45mm (1.8") without the cover. The 2018 Christmas key weighs 4-1/4 ounces (120g). 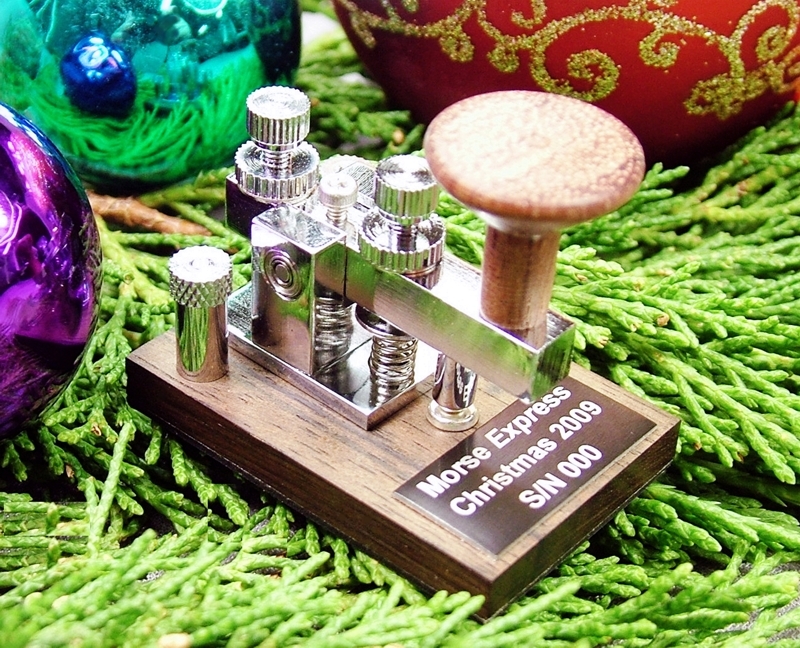 The Morse Express 2018 Christmas Key is a limited edition, priced at $89.95 plus shipping and handling. Each key has a label with “Christmas 2018” and a unique serial number. More information is available on the Morse Express web site at www.MorseExpress.com where you will also find secure ordering facilities. Call (800) 238-8205 toll free to order by phone, or (303) 752-3382 for more information. If you bought our Christmas key last year (2017) , then the same serial number(s) will be held for you this year, until approximately December 8th. The exact date will depend on how quickly we sell out of "unallocated" numbers but if you need us to hold yours longer please let us know. You can also place the order immediately with an instruction not to process your order until a specific date. If the serial number is important to you please place your order sooner rather than later. 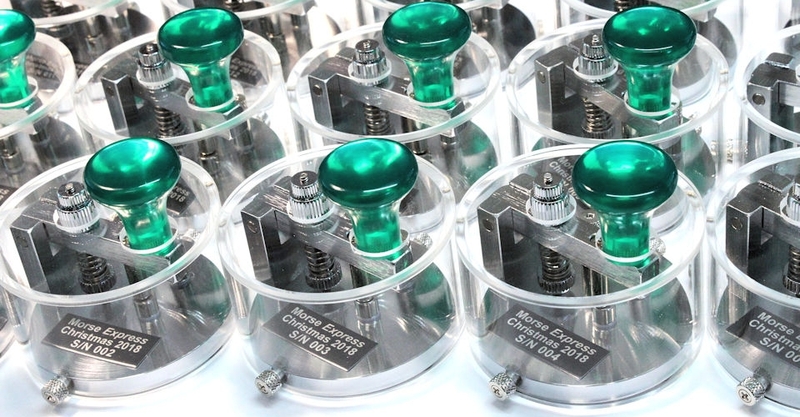 If you did not order a Christmas Key from us last year, you may be offered the opportunity to purchase last year's and this year's keys with the same serial number, depending on the circumstances. earlier Christmas Keys are still available. 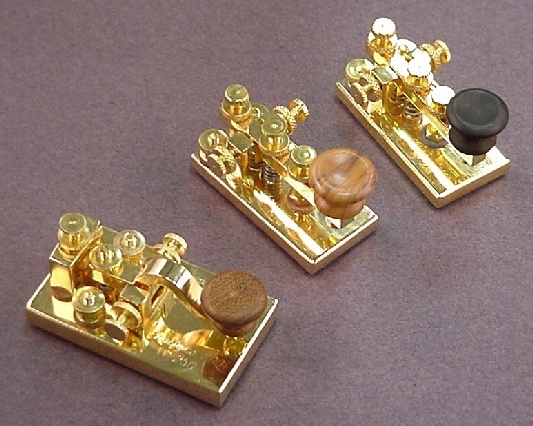 Beginning in 2008, our Christmas Keys were made for us by GHD Telegraph Key in Japan. Prior to 2008 they were made by LTA Keys in Spain, and in fact our 2005 Christmas Key is the only LTA key left in our inventory. While stocks last, we can give you a 10% discount on the purchase price if you buy 3 or more of the older Christmas Keys. Order your keys above, and click on the link at the right to claim the discount. The discount code will be shown in your shopping cart and the actual discount will be shown on your final order confirmation.